Only recently discovered, Hesperonychus is being hailed as the smallest known dinosaur, weighing less than a housecat at 4-5 pounds. Defying expectations that the smallest dinosaur would in fact be a Compsognathid, Hesperonychus is a dromaeosaurid, closely related to Velociraptor. It was found in Alberta, first in 1982 & described by paleontologists Phillip Currie & Nick Longrich only now. 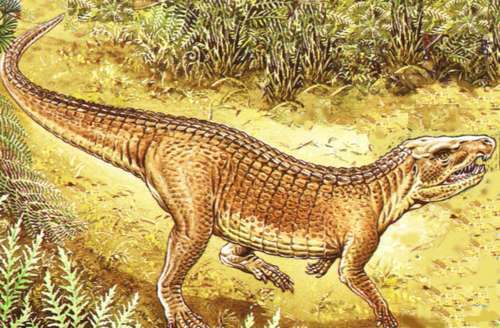 Any doubts that it was a mature animal were demolished when it was pointed out that the bones in the hip were fused, which would not be found in a juvenile specimen. Hesperonychus would have most likely hunted small insects, mammals & lizards. Part of what makes Hesperonychus so exciting is due to its location, where few small dinosaurs have been found. The discovery suggests other small animals filling in the previously absent niche for small predators in the area.